The Slow Movement advocates a cultural shift toward slowing down life’s pace. The principal perspective is to experience life in a fundamentally different way. For millennia, sages have taught that the experience of being present leads to richer experiences. It is not organized and controlled by a singular organization. A fundamental characteristic of the Slow Movement is that it is propounded, and its momentum maintained, by individuals that constitute the expanding global community. Although it has existed in some form since the Industrial Revolution, its popularity has grown considerably greater each year. The International Institute of Not Doing Much is an approach to workaholism, incivility, and time poverty through humor and storytelling. The Institute’s fictional presence promotes counter-urgency. First created in 2005, it is a continually evolving work of art and humor. Melaleuca quinquenervia, commonly known as Niaouli or Broad-leaved Paperbark or the Paper Bark Tea Tree, is a medium sized tree of the allspice family, Myrtaceae. The plant is native to coastal Eastern Australia, in New South Wales and Queensland. It has become naturalized in the Everglades in Florida, where it is considered a serious weed by the USDA. 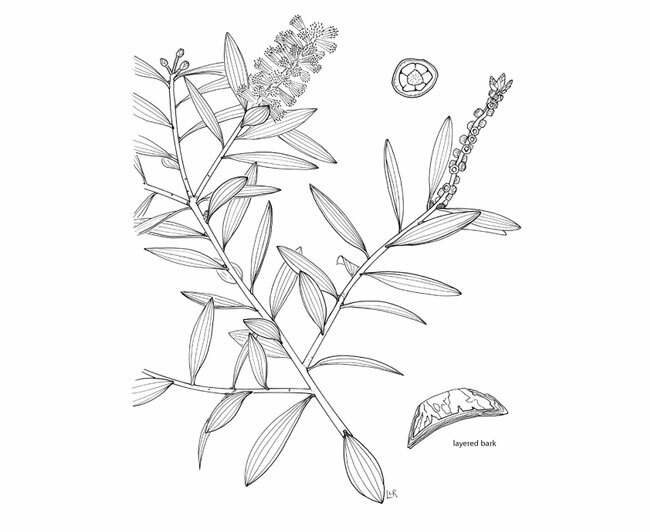 Melaleuca is used traditionally by indigenous Australians. A brew is made from the bruised young aromatic leaves to treat colds, headaches and general sickness. The steam distilled leaf oil of the cineole chemotype is also used externally for coughs, colds, neuralgia, and rheumatism. A nerolidol and linalool chemotype is also cultivated and distilled on a small scale for use in perfumery. The flowers serve as a rich source of nectar for other organisms, including fruit bats, a wide range of insect and bird species such as the Scaly-breasted Lorikeet (Trichoglossus chlorolepidotus), the Grey-headed Flying Fox (Pteropus poliocephalus) and the Little Red Flying-fox (P. scapulatus), which all consume the nectar and flowers. Melaleuca is known for its capability to withstand floods and droughts. If there is a canopy gap created by a flood or some other disturbance Melaleuca will establish to make use of the extra light. In physically disturbed sites, flourishing invaders have high colonization abilities. Melaleuca is constantly thinning itself of small branches and twigs and this causes many seeds to fall all the time, along with the detrius. Alien abduction insurance is an insurance policy issued against alien abduction. The insurance policy is redeemed if the insured person is abducted by aliens. A policy normally costs around $150 per $1.5 million in coverage. Some companies offer policies for alien pregnancy, alien examinations and death caused by aliens. More recently the Alien Abduction Insurance Corporation has launched the idea of abduction insurance certificates as a unique gift for a lifetime premium and sells it for $9.95. The first company to offer UFO abduction insurance was the St. Lawrence Agency in Altamonte Springs, Florida. The company says that it has paid out at least two claims. The company pays the claimant $1 per year until their death or for 1 million years, whichever comes first. Over 20,000 people have purchased the insurance. The insurance company Goodfellow Rebecca Ingrams Pearson stopped offering alien abduction insurance after having sold the policy to about four thousand people. At a cost of roughly $155 a year the policy would pay about $160,000 to someone who could show that they had been abducted by a being who was not from Earth. The payment would double if the insured person was impregnated during the event. Men were also able to purchase the impregnation insurance for protection against the unknown capabilities of alien technology. In decorating the house with evergreens at Christmas, it was once believed that care must be taken not to let ivy be used alone, or even predominate, as it is a plant of bad omen and would prove injurious. Ivy was used in garlands by the ancient Greeks and the Romans for religious ceremonies and was strongly associated with Bacchus, the Greco-Roman god of wine. Since Roman times, ivy has been associated with wine and wine-making. Branches of evergreen ivy tied to a pole was often used to indicate a place where wine or alcohol was for sale. Hence, the proverb “Good wine needs no bush” meaning that it is not necessary to advertise well-made goods. Ivy is less commonly seen in houses in Britain at Christmas compared to holly and mistletoe and it may be that established religions opposed its use in Christmas wreaths because of its association with drunkenness. At one time, there was disagreement between those who believed that the Christmas evergreens should be burned when taken down, and those who insisted they should not. Both sides maintained it would be dreadfully bad luck not to follow their rule, but there is no pattern to explain the different views on burning. The earliest anti-burning treatise dates from 1866, but there are references which support burning back to the eleventh century. On this evidence, it would seem that burning the Christmas evergreens was the norm until late in the nineteenth century. Holly has been a mainstay of Christmas decoration since the fifteenth century, mentioned regularly in churchwardens’ records, but many of the specific traditions about it are found in much later accounts. It has been said that the kind of holly that comes into a house at Christmas could determine who would be master during the coming year, the wife or the husband. If the holly is smooth the wife will be master, if the holly is prickly, the husband will be the master. Holly is palatable to livestock despite its spines and was extensively used as a winter fodder for livestock in medieval times. Hay and grains for wintering stock would often run short, and the livestock would eventually have to be slaughtered, causing problems to medieval economies in the following years. Thus, a supply of fresh browse would have been extremely valuable. Written records of payments and agreements involving the use of holly for livestock cover a wide period from the late 12th century to the mid-18th century, by which time the practice had been largely abandoned. In the past, many believed that it was extremely unlucky to decorate before Christmas Eve. It was once thought that if every scrap of Christmas decoration was not removed from the church before Candlemas Day on February 2nd, there would be a death within a year in the family occupying the pew where the leaf or berry was left. Festive ecology explores the relationships between the symbolism and the ecology of the plants, fungi and animals associated with cultural events such as festivals, processions and special occasions. Holly, ivy and mistletoe, plants traditionally associated with Christmas, have had special roles in earlier religions and past cultures. Houses were decorated with evergreens and bunches of holly were given as tokens of friendship. When this festival was absorbed into the Christian calendar, holly and the other evergreens were absorbed as well. The main areas in which belief comes to play in respect to Christmas decorations are which plants can be used and which are forbidden, when they are put up and taken down, and what happens to them later and whether they should be burnt or not. Artificial decorations were not introduced until late Victorian times and do not seem to have gathered any beliefs of their own.